Haydale's Composite Solutions division (HCS) has announced the launch of three graphene enhanced carbon fibre pre-impregnated (prepreg) products, in collaboration with SHD Composite Materials Ltd (Sleaford, Lincolnshire, UK) using epoxy resins from Huntsman Advanced Materials. 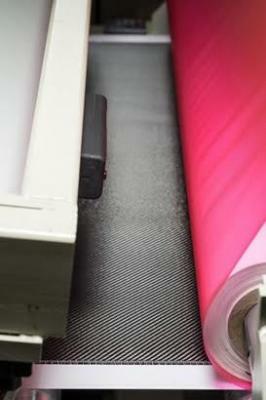 The products to be launched include a structural component carbon fibre prepreg, a prototype “Out-of-Autoclave” curing carbon fibre tooling prepreg capable of fast composite part production in autoclave processing and a higher operating temperature prepreg for enhanced life and very high accuracy tooling. The primary drivers in the development of the structural component prepreg were to increase the impact resistance and compression after impact performance of carbon fibre reinforced epoxy components through the addition of graphene nanomaterials. It is anticipated that this will enable designers to develop lighter and more efficient carbon fibre reinforced epoxy structures where impact is the principal design consideration. Key target applications for this new prepreg include aerospace, automotive and high performance sports goods such as bike frames, fishing rods and racing boats. Development of the higher operating temperature prepreg is targeted at producing tooling systems with increased thermal conductivity (to reduce process cycle times), significantly reduced spring-back and greatly improved accuracy, improved surface finish, better impact resistance and increased resistance to micro-cracking over currently available prepreg materials.